Mexico's President Enrique Pena Nieto shakes hands with U.S. Secretary of State Rex Tillerson at Los Pinos presidential residence in Mexico City, in this photograph from the Mexico Presidency, Feb. 2, 2018. United States Secretary of State Rex Tillerson said in Mexico on Friday that immigrants bring "enormous value" to the U.S., but added the U.S. government lacks "good discipline" in regulating who enters the country to live. After meeting in Mexico City with Mexican Foreign Secretary Luis Videgaray and Canadian Foreign Minister Chrystia Freeland, Tillerson told reporters the U.S. has put "many mechanisms in place" over the years to control immigration, but has "never gone back to clean this up." "Let's make sure we have systems in place where we understand who's coming into the country," Tillerson said. He said immigration in the U.S. has "gotten out of normal order," which is why President Donald Trump is pushing Congress to "fix these defects that have risen over the years." 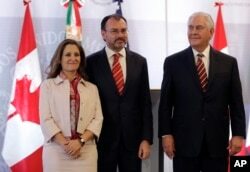 Canada's Minister of Foreign Affairs Chrystia Freeland, from left, Mexican Foreign Minister Luis Videgaray, and U.S. Secretary of State Rex Tillerson, pose for a group photo at the end of their joint press conference in Mexico City, Feb. 2, 2018. The Mexican government has repeatedly expressed opposition to Trump's proposals to curb illegal immigration and have Mexico pay for a reinforced border wall. Differences over the issue did not preclude Videgaray from praising the U.S. He said the Mexican government's relationship with the Trump administration is "closer" than it was former President Barack Obama's administration. Videgaray acknowledged the two countries "do have some differences" but said "we are working closely and we are about results." Tillerson later held a closed-door meeting with Mexican President Enrique Pena Nieto during a time when relations have also been strained by U.S. threats to pull out of the North American Free Trade Agreement (NAFTA). NAFTA, which Trump alleges costs American jobs, was discussed at the trilateral meeting, along with energy development and drug interdiction. Tillerson's visit to Mexico is the first stop on a six-day trip through Latin America that will also take him to Argentina, Peru and Colombia, with a final stop in Jamaica on February 7. U.S. Secretary of State Rex Tillerson is on a six-day trip to Latin and South America. 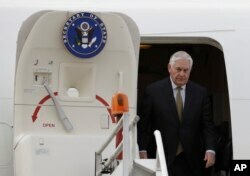 Before embarking on his trip, Tillerson delivered a speech Thursday at his alma mater, University of Texas at Austin, during which he warned that China and Russia are assuming "alarming" roles in Latin America and urged regional powers to work with the U.S. instead. He also derided Russia for selling weaponry to unfriendly, authoritarian governments in the region. After visiting Buenos Aires and the Argentine mountain resort town of Bariloche, Tillerson is scheduled to meet in Lima with Peruvian President Pedro Pablo Kuczynski on various issues, including the eighth annual Summit of the Americas, which is to be held April 13-14 in Lima, Peru. In Colombia, Tillerson plans to meet with President Juan Manuel Santos and other officials. They're expected to discuss not only Venezuela but also "the surge in coca cultivation and cocaine production, economic issues and the growing refugee population" from neighboring Venezuela, the State Department said. U.S. Secretary of State Rex Tillerson exits his plane as he arrives in Mexico for a two-day visit, at Benito Juarez airport in Mexico City, Feb. 1, 2018. Tillerson is also expected to rally the region's governments in pressing democratic reforms in crisis-ridden Venezuela. The United States will use "all its political, diplomatic and economic tools to address the situation in Venezuela," a senior State Department official said at a briefing this week on the trip. Venezuela is in its fifth year of a worsening political and economic crisis. In January, the U.S. Treasury Department added four current or former Venezuelan senior military officials to its sanctions list, accusing them of corruption and repression that have contributed to critical shortages of food and medicine and the erosion of human rights. The European Union also has imposed sanctions, and the Organization of American States' secretary general, Luis Almagro, has championed democratic reforms for Venezuela. On Thursday in Texas, Tillerson said the administration was not advocating for a "regime change" in Venezuela. He did, however, say it would be "easiest" if President Nicolas Maduro chose to leave power on his own. Maduro, who accuses the United States of leading an international effort to topple his socialist administration, announced in January that he would seek a second six-year term and called for an election by April 30.